would you invite your neighbors over and throw a party for them? "What woman wouldn’t?" Jesus asks. Truth be told, I am not sure if I would. I am probably more stingy than that. Are you worth a party? This parable is only found in Luke’s Gospel. In Luke it is paired with the parable of the man who had 100 sheep and loses one. He goes and searches until he finds it and then invites the neighbors over for a party. Then Luke adds the parable of the man who had two sons. returns home and is welcomed by the Father who invites the neighbors for a party. Also in Luke’s setting are a bunch of religious people who don’t like parties. They are the Pharisees and the Scribes. and the Father welcoming the lost son. It is likely that the parables of the lost sheep and coin had lives of their own. and each of those gospels uses the parable in different ways. The coin parable is unique. We only find it in Luke. Scholars kick it back and forth as to whether Luke invented the parable or not. It seems more likely to me that it was independent and used by Luke. If a man loses a sela or an obol in his house (those are ancient terms for shekel or coin), he lights lamp after lamp, wick after wick, till he finds it. Now does it stand to reason: if for these things which are only ephemeral and of this world a man will light so many lamps and lights till he finds where they are hidden, for the words of Torah which after the life both of this world and the next world, ought you not to search as for hidden treasures? --Bernard Brandon Scott, Hear Then The Parable, p. 312. The point of that story is to admonish you spend your time and your effort searching for that which is sacred, wise, and good, since you do at least that much for things of this world. There is certainly an echo with Jesus’ parable to the parable in the Midrash. The coin is a drachma, equal in value to the denarius. It was probably worth about as much as a peasant laborer would make in one day. Certainly not much, unless you are a peasant. One would not imagine Caesar sweeping his house with his lamp lit searching for a lost drachma. Some have suggested that after she finds it, she spends it on the party for her neighbors and friends. That is the spirit, isn’t it? What is the value of a coin besides what it can buy and do? What is more valuable than a celebration with friends? A celebration with friends may be the kingdom of God. Some have suggested that the ten coins might have been her dowry. The custom was to wear these coins like jewelry. We might think that losing one coin would be like losing part of an earring or other piece of jewelry that is an heirloom. It would have value beyond actual monetary value. The parable doesn’t say that, but it opens us up to explore that. We can enter the parable by taking the part of different characters. We can in this case, be the woman. We can be the coin. perhaps even a part of ourselves. We seek clarity and vision. We sweep carefully with our broom. We do the diligent work of self-discovery. Perhaps you might have lost something. Maybe you have lost some happiness. Maybe worries have taken away your lightheartedness. Maybe you have lost trust or passion. Maybe you don't know what you have lost. This parable is the invitation to light a lamp for clarity and insight and sweep away the dirt and debris and find that lost coin. 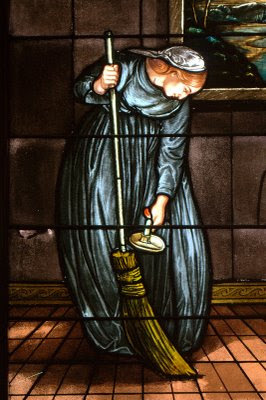 Images of lighting lamps and sweeping are images of discovery and soul-searching. When you find that part of you that has been lost, you are whole again. You cannot keep that to yourself. The parable may invite that type of exploration. For what am I searching. How am I engaging in this search? When I find it, what will I do to celebrate? Maybe you have already found what you lost. You just need to have the party. Celebrate while you have the coin. We can also be the coin. There isn’t much we can do as a coin, which is a lesson as well. As a coin, we can only be, and be found. The parable does want to show us that the coin is not of high value in terms of Wall Street. This coin, while having little value to Empire, has great value to this woman. The value of the coin is shown in the parable by her diligence, effort, and celebration. The parable reminds us that those things and perhaps people that don’t seem so important and valuable are sought after by the Universe. The woman lighting a lamp and sweeping in search of the lost is a metaphor for the Divine search for every soul. No soul is without value. No person is without value. a bit lost, not thinking you are very important. "Who cares about me and my problems?" the Divine Wisdom Woman is diligently searching us out. Her broom is sifting through the dirt. She won’t stop until she finds us. When She gathers us there will be great rejoicing and a party in our honor! And the party is what it's all about. I love this story! First Jesus chooses a woman for the story, rare in his day. But I've always pictured her not only sweeping but even carrying the furniture out into the yard to find the coin. Being found, I think is the most important thing in life. And yes, I would include being found by Jesus but also found by others. That person who sleeps under the bridge needs to be found not only for food and housing but also to be seen as a person. It also reminds me of Eleanor Rigby who never did get found. I too love the story. However, I must be picky about the picture. The houses that most people lived in during this time had dirt floors and the lamp was a lamp not a candle. The KJV translated the Greek word for lamp to candle but it was a lamp. Biblical lamps were designed to fit inside your palm and burned olive oil.